Seventh-seeded Dominic Thiem held off Benoit Paire 6-4, 6-3, 5-7, 1-6, 6-3 in a first-round Australian Open match that finished after 2 a.m. on Wednesday. Thiem, a French Open finalist last year, got the decisive break in the eighth game of the fifth set and had two match points when he coasted to 40-15 in the next game. But the No. 61-ranked Paire wasn't finished yet. He saved one with a rifling forehand winner, another when his miscued forehand clipped the net and landed on Thiem's side, and yet another with a deep forehand winner. Then he ran out of luck. Thiem will next play Australian wild-card entry Alexei Popyrin, who beat Mischa Zverev 7-5, 7-6 (7), 6-4 earlier on day two. Naomi Osaka's first appearance at a Grand Slam tournament as a major champion was a successful one. She beat Magda Linette 6-4, 6-2 to end play at Rod Laver Arena on day 2 of the Australian Open. Osaka, who beat Serena Williams in last year's U.S. Open final, needed just 58 minutes for her first-round win over Linette. Her win at Flushing Meadows last year as a 20-year-old made her the youngest U.S. Open champion since Maria Sharapova in 2006. Osaka's next opponent will be Tamara Zidansek, who beat Daria Gavrilova 7-5, 6-3 earlier Tuesday. Simona Halep climbed out of a deficit of a set and a break to avoid becoming the first No. 1-seeded woman to lose in the Australian Open's first round in 40 years. Halep reeled off the last four games, and 13 of the final 15 points, to come back and beat Kaia Kanepi 6-7 (2), 6-4, 6-2. Kanepi received treatment from a trainer for a blister on her left ring finger in the third set. Kanepi had beaten Halep at the U.S. Open in September, only the sixth time in the professional era that a woman seeded No. 1 exited a Grand Slam tournament in the opening round. Milos Raonic hit 30 aces and never faced a break point to beat local hope Nick Kyrgios 6-4, 7-6 (5), 6-4 in a first-round match at Melbourne Park. It was the seventh meeting between the pair and the first since 2016, and Raonic has now taken a 4-3 advantage. Their first three meetings were all in majors, with Raonic winning at the French Open and Wimbledon in 2014 and Kyrgios at Wimbledon in 2015. Raonic next plays former champion Stan Wawrinka, who advanced when his opponent Ernests Gulbis retired in the second set of their match with a back injury. 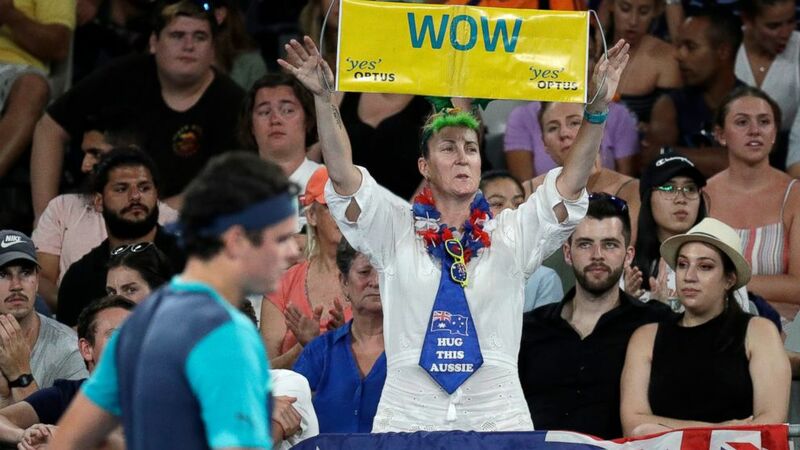 A day after the new 10-point tiebreaker was used to decide a match in women's singles at the Australian Open, the men had their first decided in the same way. Jeremy Chardy beat fellow Frenchman Ugo Humbert 3-6, 7-6 (6), 6-4, 6-7 (4), 7-6 (6), with Chardy advancing when he was the first player to reach 10 points in the fifth-set tiebreaker. Chardy flung his arms in the air on Court 10 at Melbourne Park when Humbert hit a forehand wide. On Monday, Katie Boulter had the distinction of winning in the first-ever 10-point tiebreaker. She forgot about the new rule and celebrated prematurely when she reached seven points, but composed herself and hung on to win three more points over Ekaterina Makarova, taking the match 6-0, 4-6, 7-6 (6). The new Australian Open tiebreak rules means all four Grand Slam tournaments have different rules to determine tied final sets. Wimbledon announced in October it will have a standard first-to-seven-points tiebreaker when the deciding set reaches 12-12. The U.S. Open was the first Grand Slam tournament to introduce final-set tiebreakers, with a first-to-seven-points game at 6-6. The French Open is now the only Grand Slam tournament that does not use a final-set tiebreaker; players must win by two games in the fifth set for men and third for women. Simona Halep is not done just yet. Trying to avoid a second consecutive first-round exit as the No. 1 seed at a Grand Slam tournament, Halep has forced a third set against Kaia Kanepi by taking the second by a 6-4 score. Kanepi won the opening set 7-6 (2) and was up a break in the second before Halep climbed back into the match. Novak Djokovic opened his quest for a record seventh Australian Open title and his 15th Grand Slam singles championship with a 6-3, 6-2, 6-2 win over American qualifier Mitchell Krueger. Djokovic had a worry-free win, breaking his opponent in the fifth game of the third set to help ensure he'd finish the match in a tidy 2 hours, 3 minutes. The No. 1-ranked Djokovic received the luck of the draw when both of his top rivals, No. 2 Rafael Nadal and third-seeded and defending champion Roger Federer, were placed in the other side of draw. That means Djokovic could not face either Nadal or Federer until the final on Jan. 27. Djokovic's highest-ranked opponent in his half of the draw is No. 4 Alexander Zverev, who also won Tuesday. Simona Halep has dropped the opening set against Kaia Kanepi, putting her in danger of becoming the first No. 1-seeded woman to lose in the Australian Open's first round in 40 years. Kanepi took the first set 7-6 (2). This would be Halep's second consecutive exit in the first round at a Grand Slam tournament — and second in a row against Kanepi, too. Halep's loss to Kanepi at the U.S. Open last August was just the sixth time in the half-century professional era that a top-seeded woman lost her opening match at a major. The only time it's happened in Australia was when Virginia Ruzici, Halep's manager, was beaten in 1979. A coin toss before the start of a tennis match is usually a straightforward deal: A shy ballboy or ballgirl, often in awe of the players in front of them, meekly tosses a coin in the air to determine who serves to start the match. Skyler Benson had different ideas on Tuesday. Just before the start of a first-round match between Kei Nishikori and Kamil Majchrzak at the 7,500-seat Margaret Court Arena, the 12-year-old Benson kicked out his foot and did a Michael Jackson-style spin at the net, then flipped the coin. Both players and the chair umpire smiled and the crowd laughed and applauded the impromptu performance. "Did not expect that," the Australian Open organizers posted on Twitter, including a video of the dance. "That's one way to start a match ..." the official US Open tennis Twitter feed said. "That kid knows it's his 15 seconds to shine and make an impression," another person wrote. Most of the comments were complimentary. One didn't follow the trend, though, and posted: "If I had anything to do with running the tournament, this kid wouldn't be making it onto social media, he'd be straight out the door." Nishikori won the match in the fifth set when Majchrzak retired with an injury. Stan Wawrinka extended a 14-year streak at the Australian Open with a little help from Ernests Gulbis' back. Wawrinka won the Australian Open in 2014 for his first Grand Slam title and has now reached the second round in each of his appearances at Melbourne Park. He won his first-round match over Gulbis when the Latvian player had to retire at 3-6, 3-1 because of a back injury. Gulbis received treatment on his back earlier in the match. Wawrinka, now ranked 59th, did not win a title in 2018, with his best result being a pair of semifinal results. He reached the quarterfinals at Doha ahead of the Australian Open. Hey, Twitter, Denis Shapovalov has a message for you: He wants his account back. After the 19-year-old Canadian's 6-2, 6-3, 7-6 (3) first-round win over Pablo Andujar at the Australian Open, Shapovalov was asked why had "deleted" Twitter, where he had about 62,000 followers. "I honestly didn't," Shapovalov quickly interjected. "I'm just having some issues getting it back up running. There's some issues with my birth date and stuff. I'm actually just trying to figure that out right now. They don't want to let me back in. Please, Twitter, let me back in." Shapovalov says he thinks the suspension, which began about four months ago, has "worked out for the better." "I feel I'm just a little bit less on my social media now with my Twitter gone," he said. But, "I definitely would love to have that back." Shapovalov said he's unsure exactly why his account was suspended, but he thinks it involves his age and that he may have joined the social media platform when he was too young. He says they now want a letter, possibly from his parents, verifying his age. In the meantime, he still has Instagram — where he has 261,000 followers — to play around with. "It's just been a little bit of a struggle, but hopefully they'll let me back on soon," he said of his Twitter account. "We'll see." Venus Williams was one game away from being ousted from the Australian Open's first round before coming all the way back to eliminate 25th-seeded Mihaela Buzarnescu 6-7 (3), 7-6 (3), 6-2. Williams needed more than 2½ hours to pull out the victory and avoid what would have been her fourth opening-round loss in her past six appearances in Melbourne. This is the first time in five years that Williams is not seeded at a Grand Slam tournament. Williams trailed by a set and a break at 5-3 in the second when Buzarnescu served for the match. Williams broke at love there, was better in the second tiebreaker, then surged ahead quickly in the final set with a break to lead 2-0. Venus Williams is headed to a third set in her opening match in Melbourne against 25th-seeded Mihaela Buzarnescu. Williams, a seven-time Grand Slam champion, dropped the first set in a tiebreaker 7-6 (3), then took the second by the same score. She broke Buzarnescu when the Romanian player served for the victory at 5-3 in the second set. This is the first time in five years that Williams has been unseeded at a major tournament. She is currently ranked 36th. Two-time champion Victoria Azarenka's return to the Australian Open for the first time since 2016 has ended in a first-round loss to Laura Siegemund. Azarenka, who won back-to-back Australian Open titles 2012 and '13, lost 6-7 (5), 6-4, 6-2 to the No. 110-ranked Siegemund. The first set was delicately poised in the tiebreaker when Azarenka took control, but Siegemund said she "took time out and I reset myself" in the break and regained control of the match. She broke the 29-year-old Azarenka's serve seven times, including three times in the last set. The former No. 1-ranked Azarenka took time out of the game after birth of her son, Leo, in December 2016 and reached the round of 16 at Wimbledon in 2017 but did not play any further tournaments in the season after taking time out again for personal reasons. After skipping last year's Australian Open, she steadily improved at the majors after a first-round exit at the French Open, a second-round loss at Wimbledon and a third-round appearance at the U.S. Open and moved to to No. 53 in the rankings. Tenth-seeded Daria Kasatkina has lost 6-3, 6-0 in the first round of the Australian Open to Timea Bacsinszky. Kasatkina, who reached the quarterfinals at the French Open and Wimbledon and broke into the top 10 last October after winning a title in Moscow, struggled with her serve and had nine double-faults in the 55-minute defeat. It was the third consecutive tournament in Australia where Kasatkina lost in the first round following her early exits at the Brisbane International and the Sydney International. Fourth-seeded Alexander Zverev broke Aljax Bedene's serve in the seventh game of the third set and went on to complete a 6-4, 6-1, 6-4 win over the Slovenian player to reach the second round at Melbourne Park. Zverev finished last year strongly, winning the ATP Finals with victories over Roger Federer in the semifinals and Novak Djokovic in the final. At 21, he became the youngest winner of the event since Djokovic in 2008 and the first German champion since Boris Becker in 1995. Zverev, who also won three other tournaments in 2018, hasn't advanced beyond the third round in three previous trips to the Australian Open. Serena Williams has her own name for the green one-piece suit she wore in her first-round win at the Australian Open. She was asked to describe it, for the sake of any fashion-challenged fans. It's not a onesie, it's not a leotard, the question went, so what is it? "It's a Serena-tard," the 23-time major winner said, laughing at her own description of yet another fashion statement. What it was, Williams explained, was a show of strength: "An incredibly strong, powerful statement for moms that are trying to get back and get fit. That was basically it for me." The 37-year-old Williams was back at the Australian Open for the first time since 2017, when she won the title while pregnant. She took time out from the tour and is now into her fourth Grand Slam tournament since returning. Williams developed blood clots after giving birth to daughter Alexis Olympia Ohanian Jr. on Sept. 1, 2017, and had four surgeries. She returned to the WTA Tour last March and played in two events before the French Open, where she competed in a skin-tight, full-length black catsuit. She said at the time the outfit — worn partly for health reasons because of the clots — made her feel like a superhero. Compression stockings have remained part of her ensemble, Williams said, as a precaution because she still has concerns about deep vein thrombosis. "I have had some issues, and they're not done. So it's just something I just have to do for pretty much probably the rest of my career," she said. "With DVT, it's very scary ... for me it's incredibly frightening." Eugenie Bouchard advanced to the second round at Melbourne Park with a 6-2, 6-1 win over wild-card entry Peng Shuai. Peng saved one match point on her serve but a backhand wide gave the Canadian another, and Bouchard clinched the 59-minute match with a forehand to the open court. The 2014 Wimbledon finalist's ranking dropped from a career-high of five to a current 79 to start 2019 after a series of injuries and poor form. Bouchard, who also made the Australian Open and French Open semifinals in a breakthrough 2014, will be severely tested in her second-round match Thursday when she plays 23-time Grand Slam singles champion Serena Williams. Kei Nishikori rallied from two sets down and won 10 consecutive games before Kamil Majchrzak retired with the score at 3-6, 6-7 (6), 6-0, 6-2, 3-0 at Margaret Court Arena. Nishikori had a chance to win the second set, up 30-0 on the Polish player's serve at 5-4. But he let Majchrzak back into the game and when the set went to a tiebreaker, two unforced errors by Nishikori handed his opponent the set. Those mistakes riled Nishikori between the second and third sets, obviously upset with himself as he placed ice cubes in a plastic bag on the back of his neck. Serena Williams was relentless in her first appearance at Melbourne Park since winning the title in 2017, losing only five points in the opening set on her way to a 6-0, 6-2 win over Tatjana Maria in just 49 minutes. The 23-time major winner didn't defend her title last year while she was taking time off following the birth of her daughter. Maria wasn't helped by her woeful serving — she made only three of 14 first serves in the opening set. Williams gave Maria, who also has a daughter, a warm embrace at the end of the match. The 16th-seeded Williams will face either Eugenie Bouchard or wild-card entry Peng Shuai in the second round. An Australian Open line judge was taken from the court for several minutes after being hit by a ball during a first-round men's singles match between Fabio Fognini and Jaume Munar. After being hit in the lower back by a serve from Munar, the woman was checked by medical officials and returned to continue officiating on the baseline of the match at one of Melbourne Park's minor show courts. After Munar apologized, the match was halted for several minutes. A replacement official took over briefly before the line judge returned, receiving loud applause from the crowd. Former U.S. Open finalist Madison Keys beat Australian wild-card entry Destanee Aiava 6-2, 6-2 to open play at Rod Laver Arena on Day 2 of the Australian Open. Keys broke Aiava's serve in the third game of the second set to go up 2-1, then again in the seventh game thanks in part to an Aiava double-fault and two forehand errors. Keys' best result at Melbourne Park was in 2015 when she beat Venus Williams and Petra Kvitova en route to the semifinals, where she lost to Serena Williams. She also made the quarterfinals last year, losing to 2016 champion Angelique Kerber. The now 18-year-old Aiava had the distinction of being the first male or female player born in this century to play in a main draw Grand Slam singles match when she received a wild card in 2017. She lost in the first round. Another early winner Tuesday was seventh-seeded Karolina Pliskova, who beat Czech qualifier Karolina Muchova 6-3, 6-2. Novak Djokovic and Serena Williams, with 13 Australian Open titles between them, play their first-round matches Tuesday at what is expected to be a steamy Melbourne Park. Williams, who has seven Australian titles and last won here in 2017, plays Tatjana Maria in the second match at Rod Laver Arena. Top-seeded Djokovic, who will attempt to win a men's record seventh Australian title, opens night play on the same court against American Mitchell Krueger. The temperature was already 30 degrees Celsius (86 Fahrenheit) when play began on all courts shortly after 11 a.m. local time and it was expected to rise by several degrees. The sun and humidity added to the sultry conditions, forcing many of the early spectators to take relief by standing under giant cooling mist machines.